Five stolen paintings worth about £250,000 have been found by a pensioner in the loft of his Dunbartonshire flat. 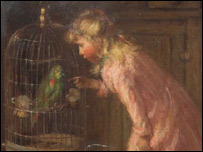 The three paintings, by Robert Gemmell Hutchison and two by Sir James Guthrie, were stolen from a house in Cairndhu Gardens, Helensburgh, in April 2002. At the time of the thefts the paintings were valued at £246,000. Strathclyde Police are trying to establish how the artwork came to be in the loft in Helensburgh, and have appealed for information. The paintings are The Pink Pinafore, Feeding the Seagulls and Cottarita by Robert Gemmell Hutchison and Luss Road and Candlelight by Sir James Guthrie. The paintings were found by a 67-year-old man who lives in the property and were recovered by police on Thursday. Det Sgt Martin Penny from Dumbarton CID said, "The investigation is at an early stage but it's important we establish how the paintings got into the loft. "A number of years have passed since the original theft in 2002 but I would ask people to cast their minds back in the hope that they remember seeing something which at the time may have seemed a little suspicious." Robert Gemmell Hutchison, who was from Edinburgh and died in 1936, did his most important work in the late 19th century and specialised in painting children and Scottish landscapes. One of his paintings, The Village Carnival, sold at auction for £110,000 in 2006. Sir James Guthrie, who died in 1930, was one of the Glasgow Boys, a collection of influential artists and designers educated in the city who did most of their work around the turn of the last century. A president of the Royal Scottish Academy, the Greenock-born artist's work features in several important collections including those of the Tate Modern and the National Galleries of Scotland. Det Sgt penny urged anyone with information to call Strathclyde Police on 01389 822 059 or Crimestoppers on 0800 555 111 .